When speaking of the warning signs of depression, at the water cures well, we have a very different view. Depression is a symptom of chronic dehydration. It is even more, it is a symptom of fluid volume and electrolyte imbalance. The most accurate description would be intercellular dehydration. Because dehydration is physically discernible, it can also be considered one of the signs of clinical depression. When we do not have enough fluids inside our cells, we have health problems. Even if there is enough water around the cells, we need the precious fluid inside our cells. Even our nervous system is made up of cells. Dr Batmanghelidj, MD, in writing on this topic used the analogy of grass that lacks water. He likened the dying grass to the early stages of depression. Depression does have some things in common with dying grass that lacks water. No wonder, since our brain is 85 percent water. We need water to survive and we need fresh water to maintain healthy function of all of our nine trillion brain cells. In reality then, depression is a symptom of chronic fluid and electrolyte imbalance (Read: Not enough water and not enough salt). Here is where the analogy Dr. B used failed. He said it was as simple as adding water to the brown grass to make it green. We respectfully disagree. It is not that simple. Simply dumping water on the brown grass will no more make it green than will drinking copious amounts of water reverse our dehydration. 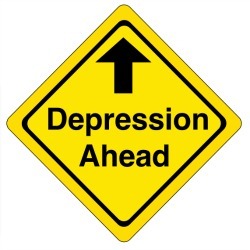 While depression may easily be reversed, it is still a process. Understanding the process will improve your ability to treat the problem. We have two oceans of water inside. One inside and one outside our cells. When we drink water, it is readily available for the ocean around the cells within a few days of drinking it. Yes, we cannot quickly re-hydrate a dehydrated body. Well, we cannot re-hydrate quickly unless we add something that will encourage the transport of the water, from out side to the inside of the cells. Unprocessed sea salt does just that. It is the electrolyte that enables the water to transport to the cells. Without adequate water inside our brain cells, our brain cannot do all the complicated functions that it accomplishes on a daily basis. It will do what it has to do, keeping us breathing and heart beating. It will shut down the things that are less necessary, like the part of the brain that makes us us. Included are the things that make us enjoy life. Thus, we end up with depression. Deepening on where in the brain we are more dehydrated, various types of depression may arise. We are left with few options to manage depression. There are the various forms of psychology, where you will talk your problems out. Funny but if you have ever had an inner dialogue, you know that in most situations in life, you can talk things over with yourself. This is, if you have an adequate fluid inside your brain cells, as well as the rest of your body. Then there is psychiatry. This discipline of medicine has the view that we are all chemically deprived. Simply adding more chemicals to our brain, we can improve our thinking, life and even depression. Basically, it is possible to medicate us into compliance. That is, if you do not mind the side effects. The chemical side effects include things like psychosis, inducing violence, mania, hostility, aggression, thoughts of and attempting suicide along with other violent reactions. How do we know about these side effects. Warnings have been issued from the United States, Canada, the European Union, Japan, United Kingdom, and Australia. The FDA’s reports that only between 1 to 10% of the side effects reported. This means that the actual number of bad reactions could be significantly higher. Water is the most effective natural medicine to help us manage and eliminate the warning signs of depression. Wait, isn't a sign something you can see? Dehydration is visibly noticeable to most hydration coaches. When we see depression, we need look no farther than the hydration status to know what to try first. To work, we need to have an electrolyte, the unprocessed sea salt to help transport the water along with the essential minerals to the many thirsty brain cells.